All Web addresses mentioned were functional as of 8-19-16. From the Cumberland Gap to the Atlantic Ocean, this is Virginia Water Radio for the week of August 22, 2016. This week, that music, by an internationally acclaimed musician who called Virginia home for many years, helps us mark an important turning point in the Atlantic tropical storm season. Have a listen for about 50 seconds. You’ve been listening to part of “Natural Disaster” by John McCutcheon, on his 1998 album “Four Seasons: Autumn Songs,” from Rounder Records. Prior to moving to Atlanta in 2006, Wisconsin native John McCutcheon was a long-time resident of Charlottesville, Virginia. While “Natural Disaster” is about the whirlwind caused by the arrival of a new baby, hearing an excerpt at this time of year reminds us that we’re right in the middle of the Atlantic tropical storm season. The season officially runs from June 1 to November 30, although Atlantic tropical storms sometimes occur in other months, as well—such as 2016’s first Atlantic tropical storm, Hurricane Alex in January. But mid-August through late October is typically the most active part of the Atlantic season, according to historical records. This year, through August 18, six named tropical storms had formed in the Atlantic basin so far, including two hurricanes. In its August 11 updated season outlook, the National Oceanic and Atmospheric Administration predicted that 2016 may turn out to be the most active Atlantic season since 2012, with forecasters asserting a 70-percent chance of a season total of 12 to 17 named storms, 5 to 8 hurricanes, and 2 to 4 major hurricanes. “Natural Disaster” and “Four Seasons: Autumn Songs” are copyright by John McCutcheon/Appalsongs and Si Kahn/Joe Hill Music, used with permission of Appalseed Productions. More information about John McCutcheon is available from his Web site, http://www.folkmusic.com/. This episode is a revision of Episode 226 (8-11-14), which has been archived. NOAA (National Oceanic and Atmospheric Administration) graph showing the predicted number of Atlantic tropical storms in 100 years, based on historical records. The NOAA caption states, “As seen in the graph above, the peak of the season is from mid-August to late October. 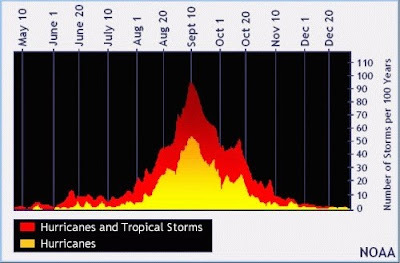 However, deadly hurricanes can occur anytime in the hurricane season.” Graph accessed at National Hurricane Center Web site, “Tropical Cyclone Climatology,” online at http://www.nhc.noaa.gov/climo/. National Oceanic and Atmospheric Administration (NOAA) mid-season update on the outlook for the 2016 Atlantic tropical storm season, as of August 11, 2016. 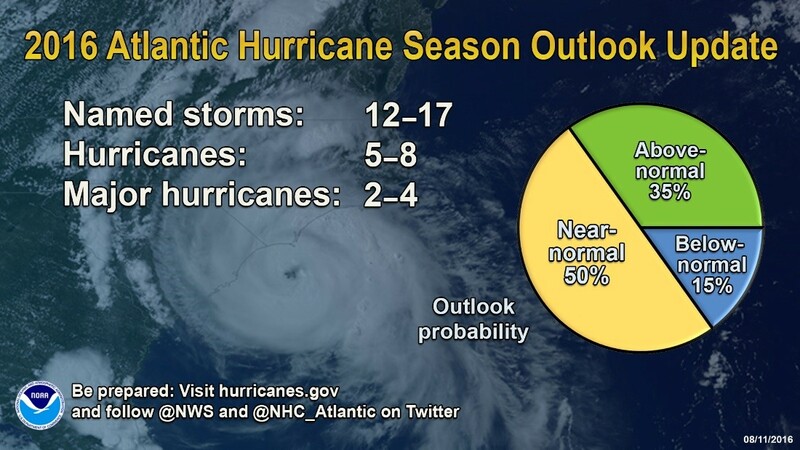 Graphic accessed at http://www.noaa.gov/media-release/atlantic-hurricane-season-still-expected-to-be-strongest-since-2012. National Oceanic and Atmospheric Administration (NOAA), Atlantic Hurricane Season Outlook as of August 11, 2016, online at http://www.cpc.ncep.noaa.gov/products/outlooks/hurricane.shtml; and Atlantic hurricane season still expected to be strongest since 2012; Forecasters now expect 70-percent chance of 12–17 named storms, 8/11/16 news release. National Weather Service/National Hurricane Center (NHC) main Web site, at http://www.nhc.noaa.gov/; archive of previous storms, online at http://www.nhc.noaa.gov/archive/2016/; and overall data archive, online at http://www.nhc.noaa.gov/data/ (see particularly “Past Track Seasonal Maps” and “Tropical Cyclone Climatology”). Information on John McCutcheon was taken from So long: McCutcheon Signs Off in Song, Charlottesville Hook, 11/13/07; “John McCutcheon's Back for Show at Haven,” Charlottesville Daily Progress, as published by Greene County Record, 8/1/11; “John McCutcheon page” on Web site of the Walnut Valley Festival in Winfield, Kansas, online at https://wvfest.com/artists/john-mccutcheon; and John McCutcheon’s Web site, www.folkmusic.com. NOAA/Hurricane Research Division, “Chronological List of All Hurricanes which Affected the Continental United States: 1851-2007,” online at http://www.aoml.noaa.gov/hrd/hurdat/ushurrlist18512007.txt. Satellite imagery of current tropical storms is available online at http://www.nhc.noaa.gov/satellite.php. Information on El Nino and La Nina is available from the National Oceanic and Atmospheric Administration (NOAA), “El Nino Portal,” online at http://www.elnino.noaa.gov/. All Water Radio episodes are listed by category at the Index link above (http://www.virginiawaterradio.org/p/index.html). See particularly the “Weather” category. Episode 317 - 5/23/16 (annual season-preview episode). 6.6 – Properties of air (including pressure, temperature, and humidity) and structure/dynamics of earth’s atmosphere. ES.12 – energy, atmosphere, weather, and climate. WG.2 - how selected physical and ecological processes shape the Earth’s surface. 8.5 (symbols and figurative language). 9.4 (imagery and other literary devices). 10.4 (imagery and other literary devices). 11.4 (imagery and figures of speech).